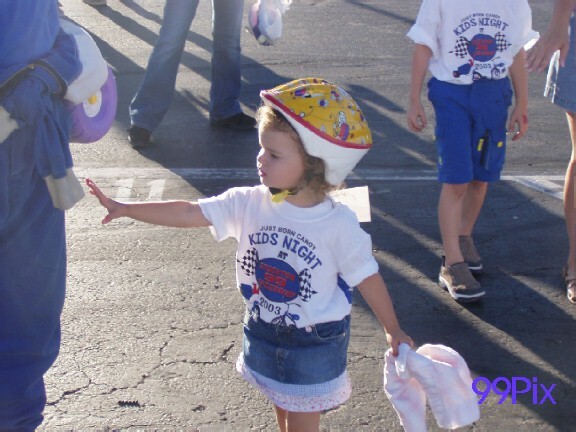 Aug. 9, 2003. . .Stockton 99 Speedway hosted “JUST BORN AGAIN CANDY” for annual KIDS NIGHT. 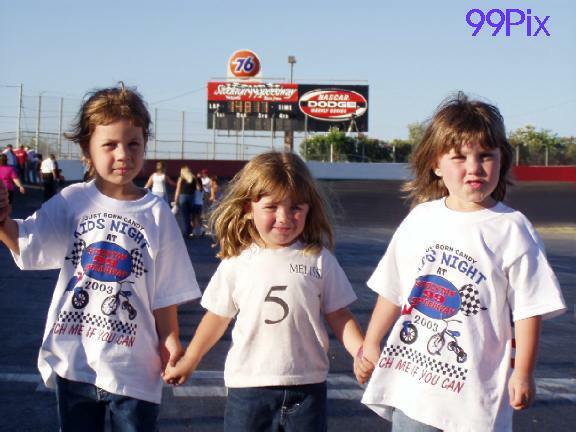 Drivers signed autographs and threw t-shirts and souvenirs to an excited crowd of young race fans. 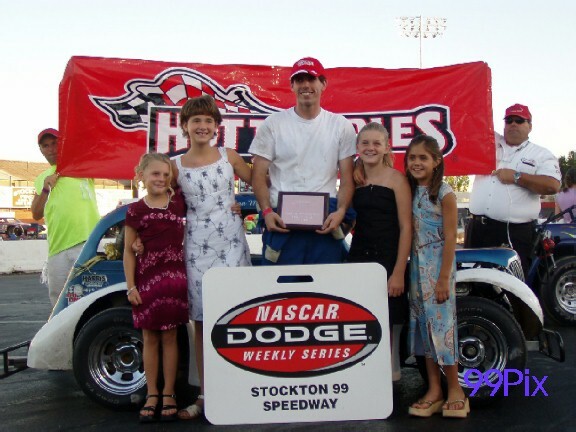 The NASCAR DODGE WEEKLY SERIES featured five big main events including Western Late Models, Pure Stock, Grand American Modifides, Pro 4 Trucks and Legends. 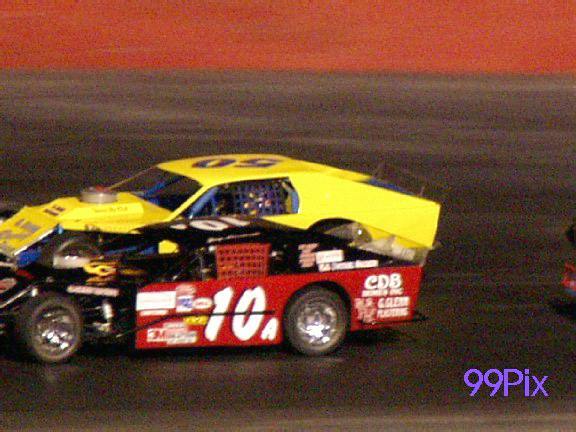 In the Western Late Model HAVOLINE C.L. 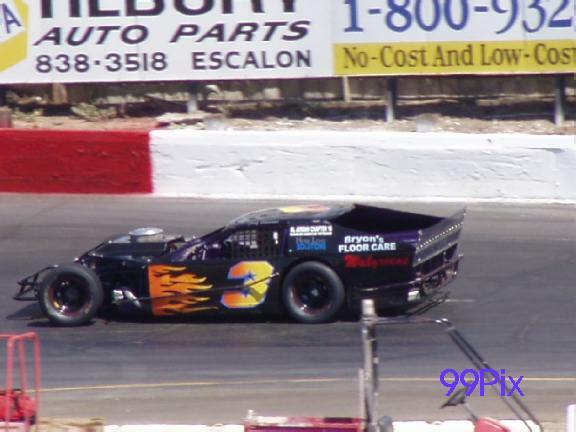 BRYANT sponsored division, Wes Miller, #2, of Turlock swiftly took the lead after the start. John Moore, #27, of Granite Bay and Dave Byrd of Pacific Grove battled head-to-head, until Moore overpowered Byrd and moved into second. Dash winner and top qualifier Harry Belletto, #74, of Modesto hastily took Byrd’s position from the inside in lap 12. Belletto was on a mission going two wide with Moore in lap 13 and dominating Moore for second. After a caution flag, Belletto saw his opportunity to take the lead opting for the outside pole position. 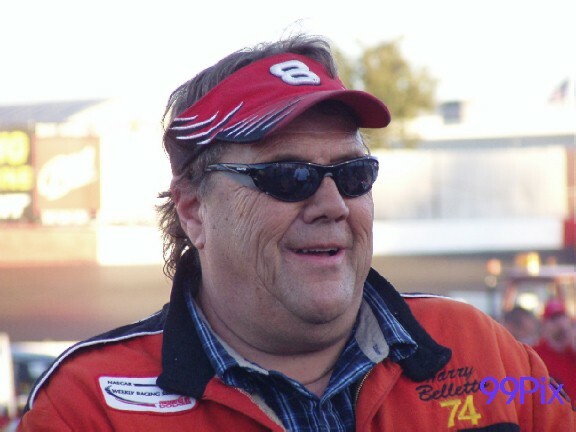 Belletto was like a slingshot capturing the lead and the victory for his sixth season win. With less than ten laps to go Eric Schmidt of Roseville had the misfortune of engine problems and was out of the race. 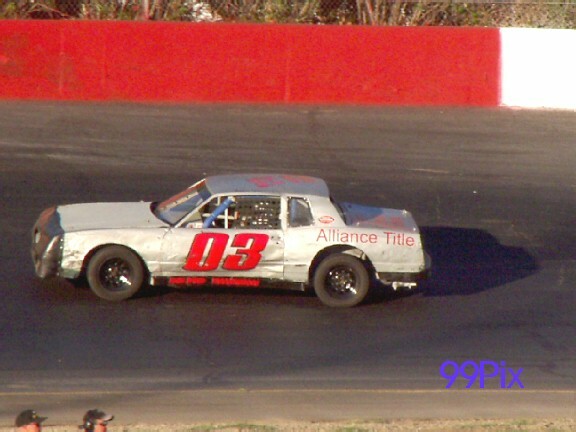 Miller maintained his position and finished 2nd, Byrd was 3rd, Pete Anderson, Jr., #5, finished 4th and Moore was 5th. In the popular Pure Stock Division semi-main winners Aimee Sullivan, #10 of Lodi, Dave Ball, #29, of Stockton, Tony Smith of Angels Camp and Chris Norton of Stockton transferred to the featured main event respectively. Top qualifier Gary Shafer, Jr., #96, had one thing on his mind, the checked flag. Shafer, Jr. went two wide with Tom Dahl of Stockton for the lead. 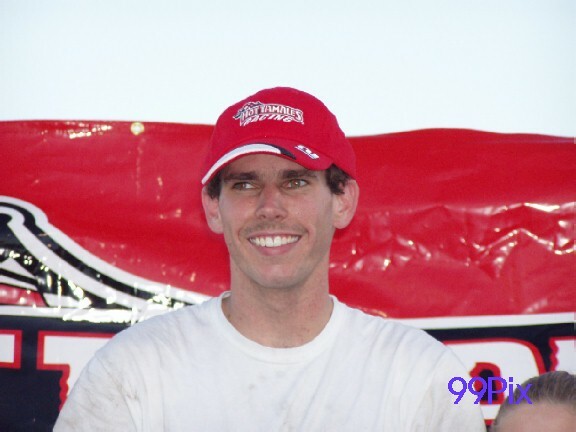 Shafer, Jr. took the lead like a freight train and maintained his position for the remainder of the race and the victory for his seventh season win. 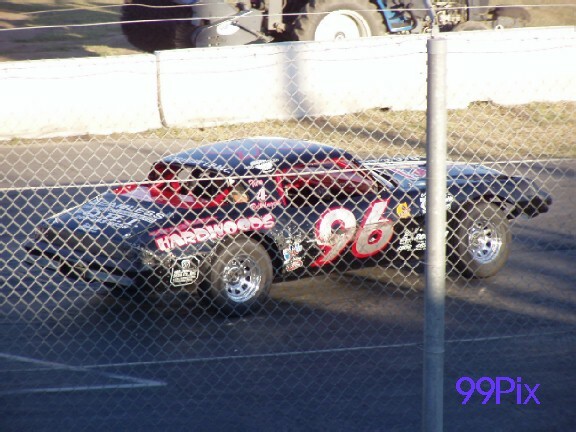 The exciting Pure Stock line up saw Joe Allen, #03 of Stockton move from first place after the start to sixth place in lap 25, but was able to maneuver his way to the front for a 2nd place finish. Jeff Ahl of Lodi finished 3rd, Tom Dahl of Stockton placed 4th and Tom Bollin of Valley Springs was 5th. Points leader and top qualifier Jay Linstroth, #10a, of Citrus Heights captured his eighth season victory and fourth straight win in the Grand American Modified division. Less than a lap into the race Ted Montague of Newark and Jason Philpot of Sacramento connected sending Montague’s smoking car into the first turn wall and into the pits for the remainder of the race. Linstroth raced back into the lead after the restart. 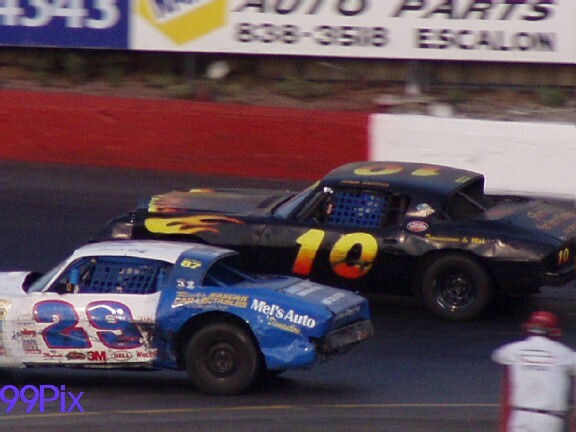 Gary Glenn, #50, Orangevale chased Linstroth, but had to battle the determined Philpot to maintain his position. Philpot dived low from the inside on lap six but was unsuccessful in his attempt to pass due to a solid lead by Glenn. A caution flag in lap eight presented the opportunity for Philpot to go low from the inside and pass Glenn for second place. 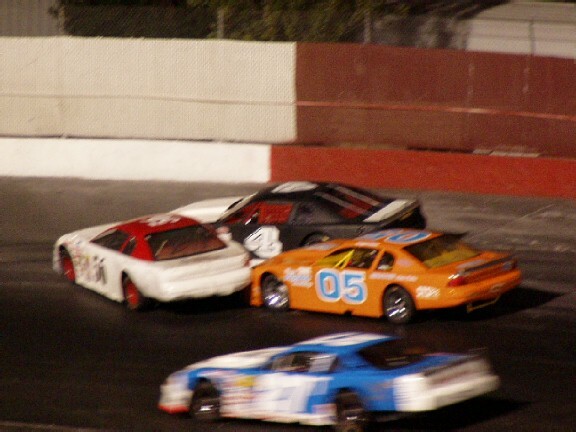 Glenn slipped into fifth place when Stockton natives Joey Sterns, #03, and Buzz DeVore, #45, gracefully passed him half way through the race. 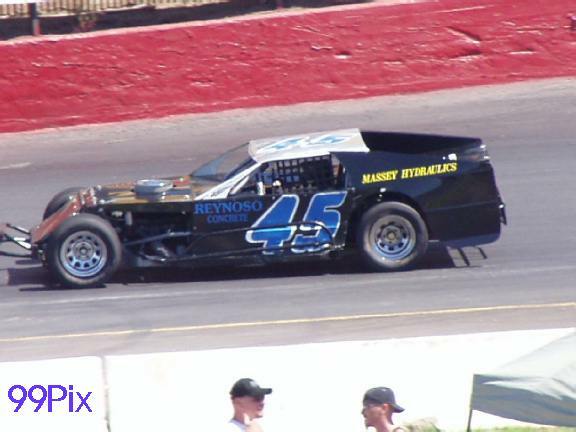 Linstroth briskly took the checkered flag, Philpot followed for 2nd, Stearns 3rd, Devore 4th and Glenn placed 5th. 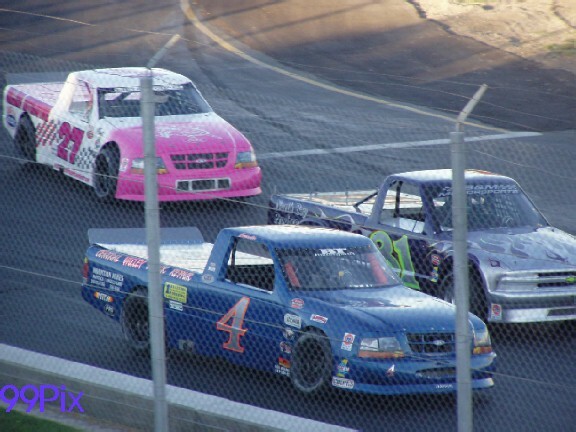 The Pro 4 Trucks returned to the speedway last Saturday. Brandon Trevethan, #4, of Tracy had a strong lead for two-thirds of the race defending it against points leader Carrie Miller, #27, of Saratoga. Miller put the heat on Trevethan, boldly taking his lead in lap 21. 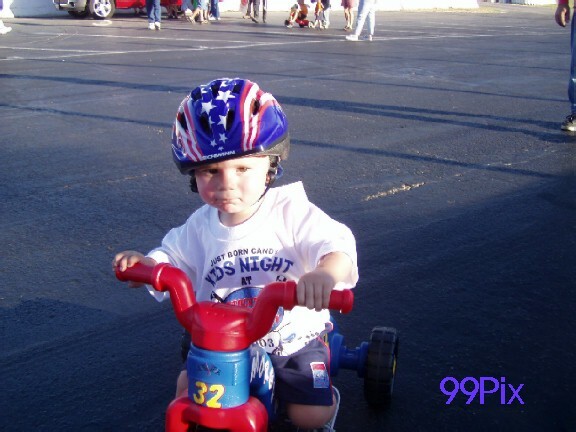 Trevethan regained control, but not in enough time to keep Bret Barney, #81, from passing for second place. 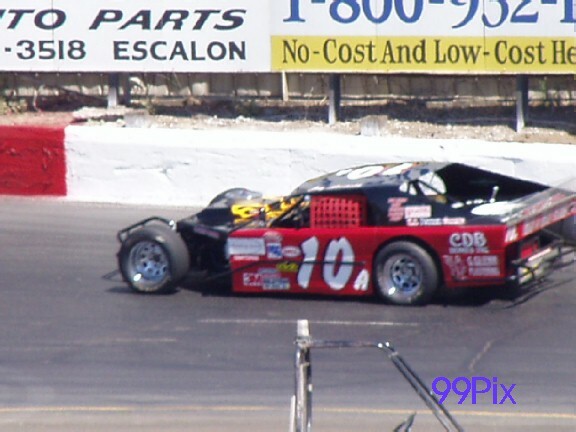 Randy Jahoda of Tracy pressured Trevethan for third and finally passed in lap 27. Trevethan made a swift move from the inside and took back third with two laps to go. Miller crossed the finish line for her fourth season win, Barney took 2nd, Trevethan 3rd, Jahoda 4th and Ron Robeck, #3, of Milpitas in 5th. In the Legends Division Ryan Mosher, #52, of Cupertino claimed victory. 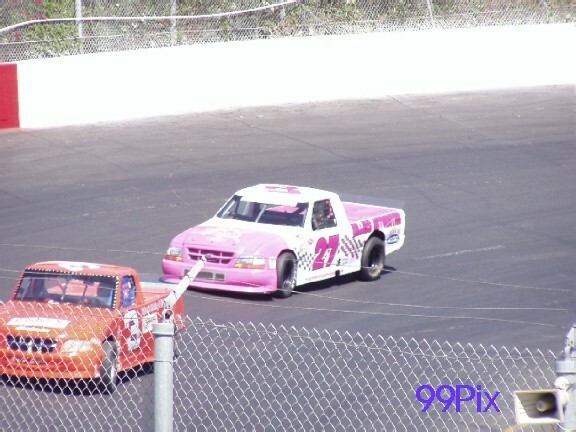 Mosher passed Frankie Winchel of Sebastopol halfway through the race. 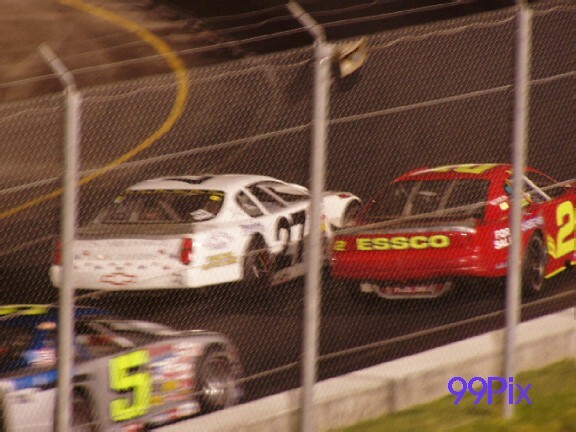 A minor accident followed by a caution flag in lap 18, sent Winchel and Rick Andrews of Santa Clara to the pits and out the remainder of the race. Mosher claimed the lead after the restart for the win. Steve Fensler, Jr. was able to maneuver in 2nd place, Rick Zollman of Pleasanton 3rd, Pat Appleby of Yountville was 4th and Pete Currin of Redwood City finished in 5th place. Qualifying begins at 4:30 p.m. Racing begins at 6:00 p.m.
Winston West 200 begins at approx. 7:30–7:45 p.m.